Do you have photos, historical accounts or other items pertaining to the Leota area? Would you like to share this historical information with the world? LakesnWoods.com would like to publish your Leota photos (current or historical) or historical accounts on this website. Original materials can be returned and your privacy will be respected. 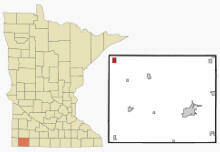 Leota is a census-designated place (CDP) in Leota Township, Nobles County, Minnesota. According to the United States Census Bureau, the CDP has a total area of 1.4 square miles (3.5 km²), all of it land. The elevation is 1,722 ft (525 m) above sea level. As of the census of 2000, there were 230 people, 113 households, and 76 families residing in the CDP. The population density was 169.0 people per square mile (65.3/km²). There were 122 housing units at an average density of 89.6/sq mi (34.6/km²). The racial makeup of the CDP was 100.00% White. Hispanic or Latino of any race were 0.87% of the population. There were 113 households out of which 17.7% had children under the age of 18 living with them, 64.6% were married couples living together, 1.8% had a female householder with no husband present, and 31.9% were non-families. 31.9% of all households were made up of individuals and 23.9% had someone living alone who was 65 years of age or older. The average household size was 2.04 and the average family size was 2.52. In the CDP the population was spread out with 15.7% under the age of 18, 4.3% from 18 to 24, 17.0% from 25 to 44, 24.3% from 45 to 64, and 38.7% who were 65 years of age or older. The median age was 58 years. For every 100 females there were 91.7 males. For every 100 females age 18 and over, there were 86.5 males. The median income for a household in the CDP was $30,568, and the median income for a family was $35,625. Males had a median income of $27,019 versus $30,714 for females. The per capita income for the CDP was $15,664. About 10.6% of families and 8.5% of the population were below the poverty line, including 7.0% of those under the age of eighteen and 16.5% of those sixty five or over. LEOTA Township was organized April 5, 1879. "The name was suggested by W. G. Barnard, one of the township's earliest settlers. 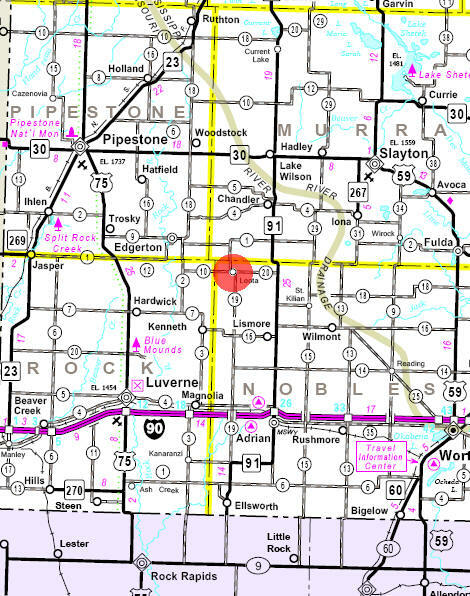 It is the only township, village or physical feature in Nobles county named in honor of an Indian. Leota was an Indian maiden who figured in a story of Indian adventure" (history of this county by Rose, p. 102). The village in sections 5 and 8 grew out of a place of the same name in Orange County, Iowa, when a large number of Dutch immigrants moved from there to this site in the 1890s. The post office operated in 1879 with Horace N. Holbrook as postmaster, was reestablished in 1894 with James TenCate as postmaster in the store he owned with John and Nick DeBoer, discontinued in 1918, and was reestablished a third time in 1931. The townsite was surveyed by M. S. Smith for TenCate in 1902.